Rent to own mobile homes can be a great option for people who want to achieve the joys of home ownership but who do not have a large down payment. A rent-to-own situation allows you to put your rent towards developing equity in your own property, and can be the first important step towards building wealth and security. Mobile homes are structures designed for residential purposes. Mobile homes are capable of being moved from one location to another, and are usually located in housing parks. Owning a mobile home is an option for enjoying the benefits of fixed accommodations without having to pay large monthly utility and/or property tax bills that may be associated with other properties, such as permanent condominiums or townhouses. Rent to own mobile homes are valued and classified the same way as any other residential real estate properties and are bought and sold through real estate listings. Many people purchase mobile homes by making a down payment and taking out a mortgage for the balance. 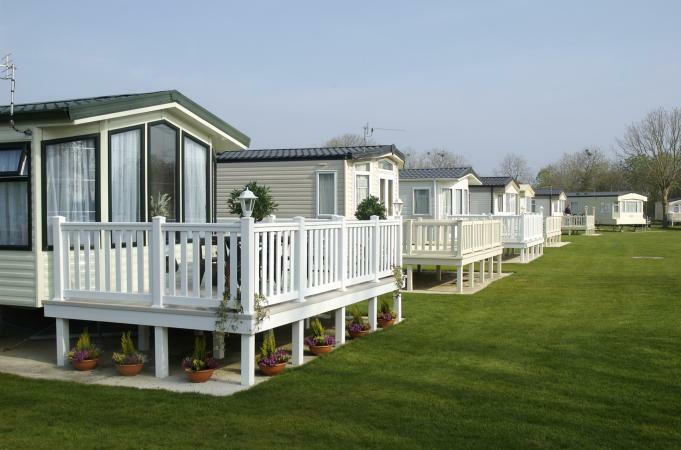 Purchasing rent to own mobile homes is an alternative purchasing option. You will typically have an agreement that specifies the number of years you will be paying under the rent-to-own term. At the end of this period of years, you then have the option to buy the property by paying the balance due. If you elect to buy, the money you have paid out as part of the rent-to-own agreement now provides you with equity in your home. You can use this equity as leverage, or as collateral, to get a mortgage to pay the rest of the cost of the house. If you opt not to buy at the end of the term, then it is as if you have just been paying rent the whole time. The slightly higher cost of rent you paid is not reimbursed, since it was paid in order to give you the option to buy. In other words, it acted as "consideration" that guaranteed that you could buy the home at a certain price if you wanted to. This unique purchasing method can be a great entry point into the real estate market if you don't have the budget for getting a mortgage. However, make sure you understand the terms and conditions involved in the title to your mobile home and its deed arrangement, and that you completely comprehend the rent-to-own contract details. How do you rent-to-own a mobile home? First you must find a seller willing to rent-to-own the property. Some sellers will specifically list a property as rent to own. However, if you find a property for rent that you like, it never hurts to ask the landlord if he might be interested in arranging a rent-to-own deal. This can benefit the landlord if he is worried about falling property values, since he will have a guaranteed buyer. Furthermore, renters who are thinking about buying tend to take great care of the property they're renting. It is essential that you do research about the property. Learn about the home and its location. There are states that will only allow mobile homes to be stationed at housing parks. Find out whether you are purchasing just the mobile home itself, or also the lot that the home sits on. If you are just purchasing the mobile home, what will the additional cost of a lot be? What other costs are associated with ownership of the mobile home? Since you are buying the property with a rent-to-own contract, there will also be a lease agreement involved. Understand the terms of the lease, as well as of how the rent-to-own process works. What portion of your rent goes towards payments that get you closer to owning the home? What happens if you are suddenly unable to make payments? Do you lose the equity you have invested and simply get evicted like any other renter? When do you have to decide if you actually want to buy the property? These are all essential questions to ask when considering a rent-to-own deal. Calculate the payment terms and what the rent and selling prices are. You should be able to buy the rent to own mobile home at a fair price, comparable to the cost of other mobile homes for sale in the area. Ensure that the total cost of the home purchase is included in your contract. If you want to have any home inspections done, complete these inspections before the start of the lease and include any stipulations in the contract. Also make sure that whoever is responsible for covering the costs of the inspection is indicated in the contract. There should be no gray areas. Finally, ask about disposal fees, security fees, utility bills, and other costs. Make sure to employ the services of a real-estate lawyer to draft the contract. List your concerns, considerations, and other notes and ensure these concerns are addressed in the contract. If the property you are interested in is listed with a realtor, he may also draft the contract for you and have all parties sign it. Regardless of who draws up the contract, it is crucial that you have your lawyer go through the entire contract and make sure there are no unfavorable terms. Rent to own purchases are less common than other methods of purchasing property, but can provide a wonderful alternative if you do your research and ensure you are satisfied with both the mobile home and the terms of your purchase.